A couple of weeks ago I did a post called “[IDEA] Mind State Messaging“, based on some conversations I’d had with Sean Howard, now of Lift Communications. Today he posted his “half” of the conversation on his blog, craphammer.ca, in a post entitled “Modeling the Role of Communications“. He delves into his thoughts on the subject and it’s a great companion read to my original post. Both of us would love to hear your feedback & thoughts on the ideas…. Far too many weeks ago I had lunch with Sean Howard (a.k.a. “Craphammer“) for lunch – we’d been talking to him, and his team at SpinGlobe, about some Clay Tablet marketing activities and he wanted to share some ideas. One idea he brought up was the concept of “mind-states” – in a nutshell, trying to identify what state of mind your target is in. It was a new concept to me (thus why I’m CTO instead of CMO) but made perfect sense once he explained it. We talked about how to visualize the notion and by the end of lunch we had a napkin sketch that consisted of mapping mind-states to messages, basically the idea of targeting each message to the specific mind states of each user. The premise is pretty straightforward. The idea is broken into four general quadrants “Mind States”, “Needs”, “Features/Benefits” and lastly “Messaging”. Each oval represents an item in that theme. Obviously in practical use these ovals would be text or images describing the specific element. I also used size the indicate importance (or, in the case of features, strength/support) – the bigger the oval the bigger or more important the item. My initial impression (and the bit Sean and I are still debating) was that behind each Mind State (which I at first considered to be an irrational state), there was a rational need or requirement behind it. I’ve dropped the notion of rational/irrational from the latest version but the notion of a Mind State being rooted in a real Need or Requirement (or vice versa) is still very much there. For example, perhaps the Mind State was “I want that promotion”, the thinking is there’s a requirement or need(s) in the background that would resolve, or contribute to resolving, the mind state. In this case it may be “deliver on sales targets”. Needs can drive States, States can drive Needs. This was all fine and dandy, but the next consideration was how mind states and needs related to your product or offering. For the most part it’s hard to link features and benefits directly to a mind state. As far as I can see, no feature I can put into my software will resolve the your mind state of “I want that promotion” but if you can uncover the true need then you can build features or identify benefits that help resolve it. 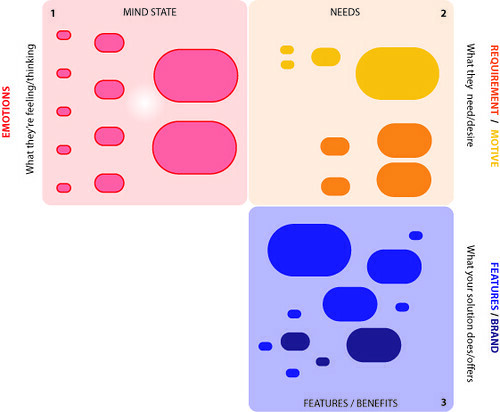 By recognizing that the users mind state is actually driven by a need (deliver on sales targets) we can now see that our “Automated Lead Identifier” and “Motivational Tool-tips” features can help the user achieve their need, by keeping them informed and motivated, which will hopefully resolve their mind-state. Because Features don’t typically speak directly to Mind States we need to close the loop with messaging. Messaging should speak to the mind state of the user. By working through the previous relationships we know that “I want that promotion” is resolved by the need to “deliver on targets” which our product helps solve by “automatically identifying new leads”. If you can craft messaging that speaks to their emotional mind state you have the opportunity to strike a real cord with them, then back it up with true features that have their needs in mind. The other side effect that came out of this exercise was the realization that this could also be used to work through product management issues. By using items that are scaled (or colour coded etc.) to represent the importance you can quickly get an impression of how your product’s features & benefits stack up. 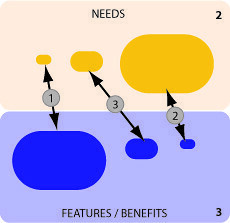 The image below shows how needs can be mapped to features or benefits, and how you can quickly gauge if your product is living up to the needs of your prospects/clients. In example (1) you can see that the need is tiny, and likely not very important in the grand scheme of things, but look at the strength (and assumedly the amount of effort that’s gone into it) of the feature in comparison. Likewise in (2) a huge need is basically going unfulfilled. Obviously depending on who your specifically targeting you won’t be able to get a perfect match (3) – in theory you’d have different Mind state maps for each persona you’re dealing with in the sales/marketing cycle – but with this model it still gives you some insight into the holes you may have in your product. Especially if the same imbalance pops up on every model etc. Anyways, this idea is still in the “half-baked” stage, but Sean and I really wanted to throw it out into the ether to see what others thought of it. I know Sean has actually thrown this into the mix on some pitches and projects over the past few weeks – but I’ll leave him to comment on where it worked/didn’t work.